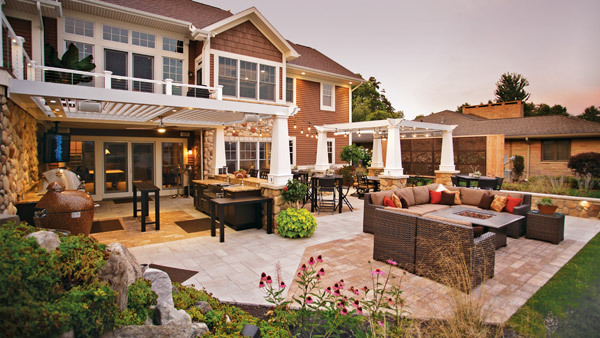 This lakeside residence may have a simple layout — that’s because it was designed to be a fun, easy-to-maintain and usable space. 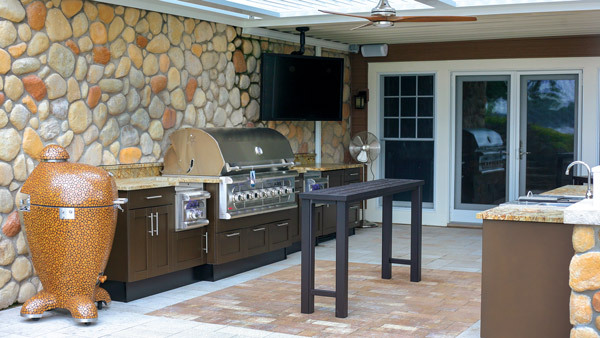 The client wanted a solution that would complement an existing upper deck and add a complete, high-quality outdoor kitchen. The space was built on the lower level of the backyard. 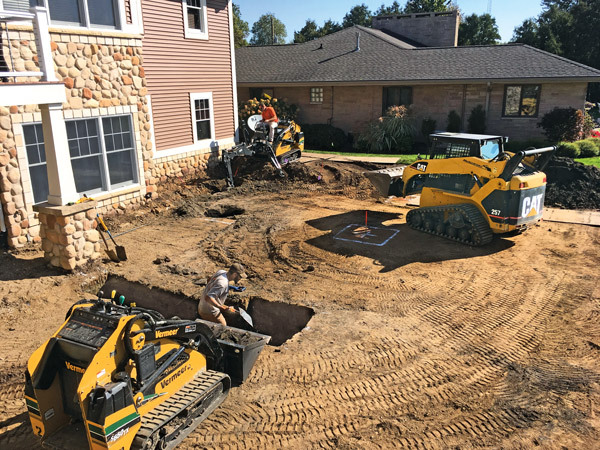 The Cornerstone Landscape Group removed or brought in more than 100 tons of materials using Vermeer mini skid-steers and a Caterpillar track loader. To round out the look of the patio, the company installed Unilock Umbriano pavers in the color of Summer Wheat. The timeline for this project was tight, posing a challenge for The Cornerstone Landscape Group. 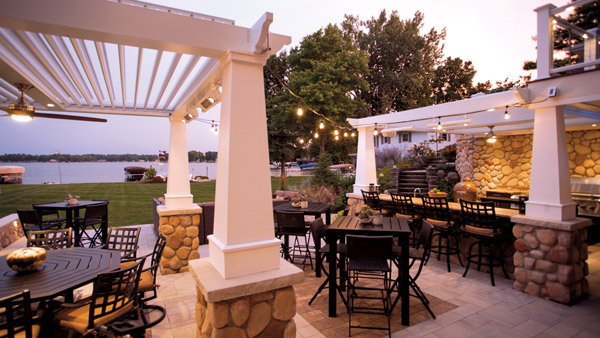 The clients wanted their patio, which encompasses more than 1,400 square feet, to be installed and ready for a spring wedding rehearsal dinner party. 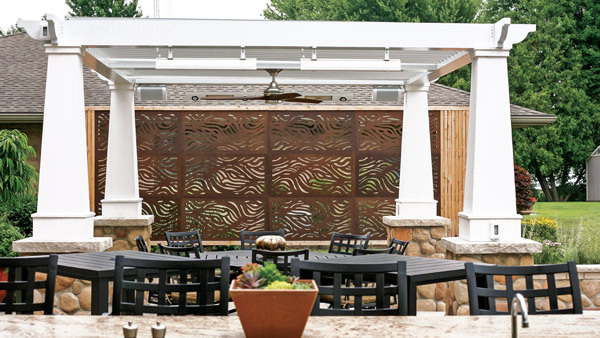 The clients now enjoy their patio almost daily, and the company uses it to show off its work to potential clients. 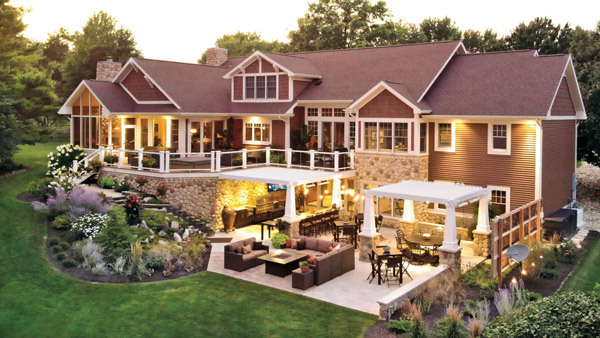 This project earned The Cornerstone Landscape Group a 2018 Gold Award from the National Association of Landscape Professionals’ Awards of Excellence program. Coordination of seven different contractors, many who needed access at overlapping times, was a particular challenge on the job. A “during” photo of a crew member installing Unilock’s Umbriano Summer-Wheat-colored pavers. 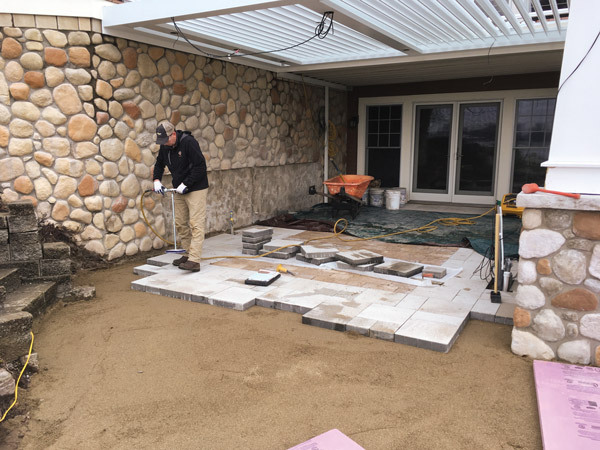 Shown here completing work on the patio, The Cornerstone Landscape Group managed to finish the multifaceted project by the clients’ deadline. 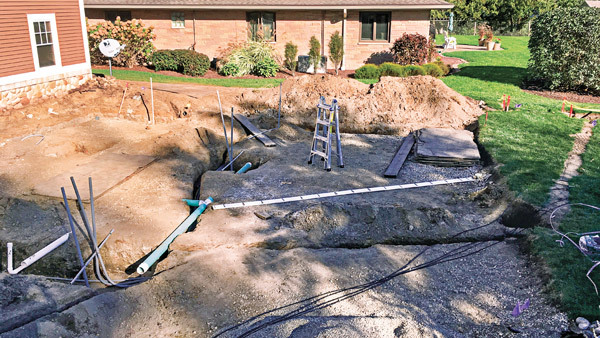 Underground utilities included electrical, natural gas, water and drain for sink, downspout drainpipes, pergola controls, audio/visual wires, landscape lighting and underground irrigation system. Because the project was located in a backyard on a lower level, access was challenging but made easier by an accommodating neighbor. As is the case with many lake properties, the neighboring house can be very close. 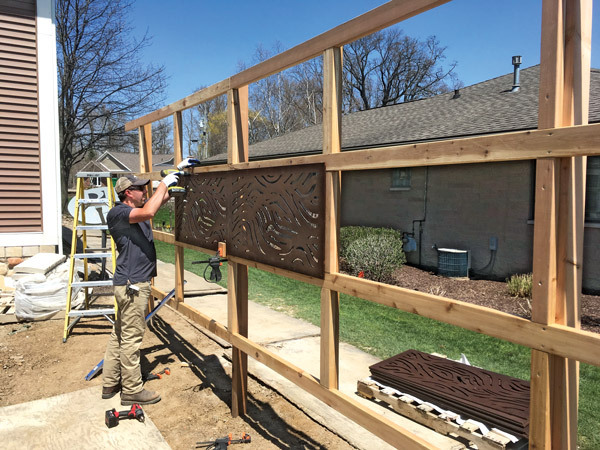 Not wanting to build a fence or wait for a natural hedgerow to grow, The Cornerstone Landscape Group introduced an OutDeco Modular Decorative Screen Panel system. 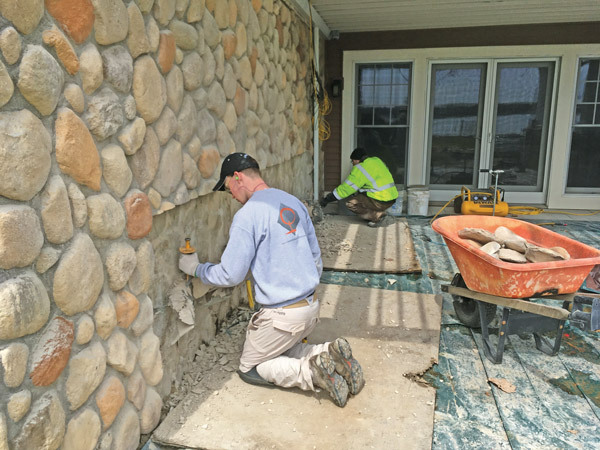 Installing some finishing touches at the front of the property. 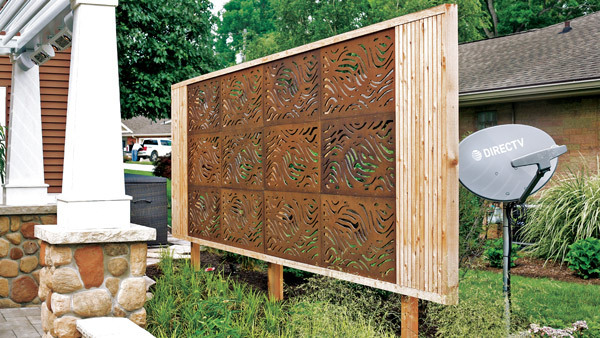 This custom screen wall provides a suitable backdrop, offers some privacy and hides a satellite dish. 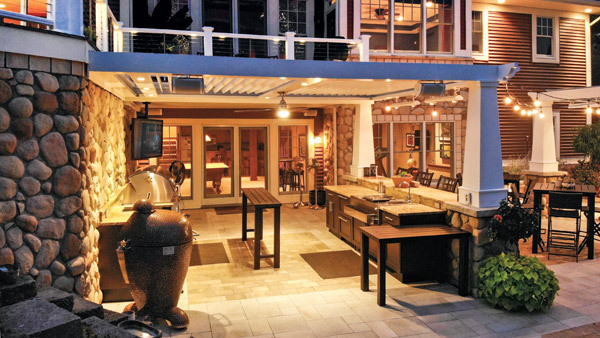 The client desired an outdoor kitchen and living space to compliment the upper deck.. 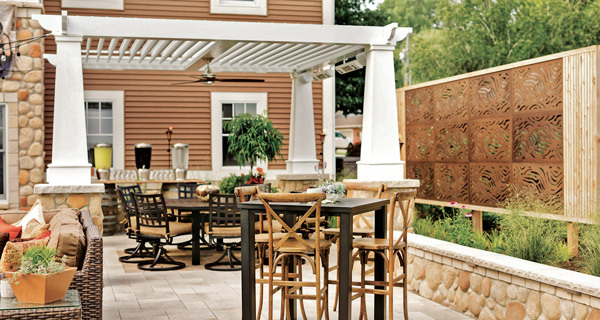 The stand-alone pergola space decorated, ready for an event. 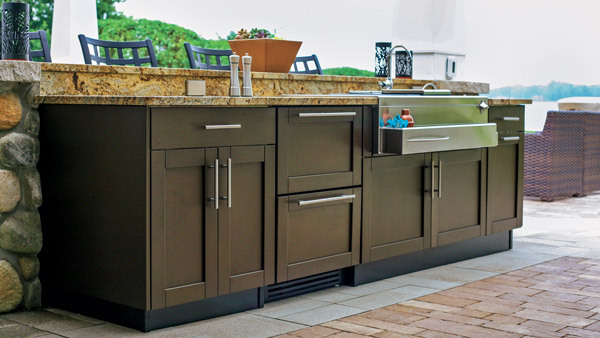 The client desired a complete, high quality outdoor kitchen with cabinets from Brown Jordan Kitchens and granite countertops. Here is an American Muscle Grill line by Summerset Grills, which are design-inspired by American muscle cars of the 1960’s. They chose a 54-inch multi-fuel grill and two side burners. A smoker from Komodo Kamadowas also incorporated. The space can comfortably accommodate groups as small as two and up to large parties. Having a waterproof covered space, without a solid roof, was important for the client. The firm deadline was for the client to host a wedding rehearsal party for their son. Catered by a local farm-to-table restaurant, over 50 guests were hosted in the space.